This recipe incorporates three vegetables that are in season during the summer but are available year round: zucchini, yellow squash, and corn. When I make this dish during the winter, I use frozen corn. 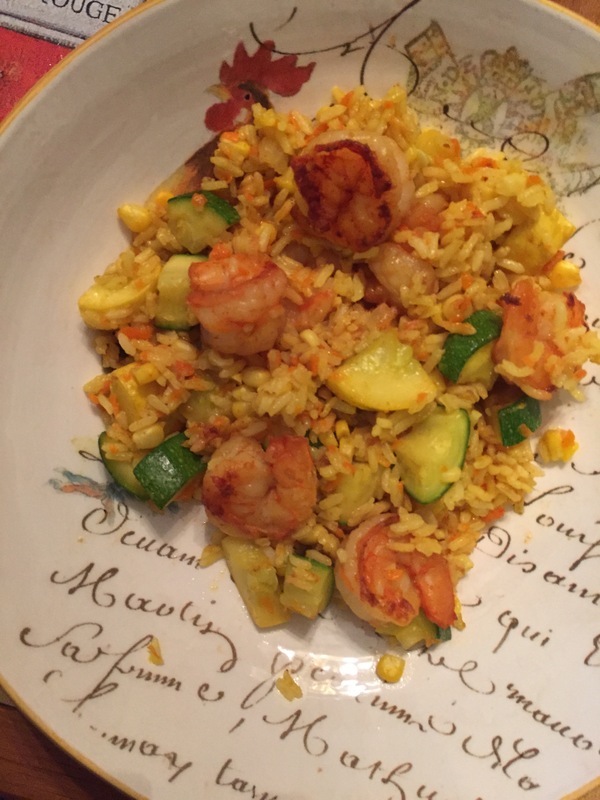 As this recipe is my own invention, the cooking and ingredients may vary from traditional paella It’s a little more involved than some other recipes on this site but it’s not complicated and takes me a total of 45 minutes. For those not familiar with removing kernels from a cob of corn, place the corn standing up on a cutting board, fat end on the bottom. Using your chef’s knife, cut inward at first and down the cob to the bottom. Rotate the cob and repeat until all the kernels are removed. If the knife gets stuck, adjust it so it is not so close to the cob. Beware the kernels will fly off so allow some clearance. Overview: start by cooking the rice (which includes the onion, carrots, and corn); zucchini and yellow squash are sautéed in a non-stick pan; shrimp are sautéed next; squash and shrimp and seasonings are combined; then rice mixture is added to the pan and tossed around; then it sits in the pan a few minutes to crisp on the bottom. In a 2 quart sauce pan heat ½ to 1 tablespoon of olive oil over medium heat. When the oil is heated enough, stir in onions and allow to cook slowly until soft and translucent. While the onions are cooking peel and grate the carrot and prepare the corn kernels. When the onions are ready, add the chicken broth, carrots, and corn; increase heat to high. When the broth boils, add the rice, reduce heat to low, and simmer (roughly 20 minutes). Heat 1-2 tablespoons of olive oil in a large 12” non-stick frying pan or sauté pan over medium high heat. If you may trade off pan diameter with a pan of smaller diameter with higher sides. While the oil heats, prepare the squash or you can prep it as your first step. Trim the ends off the squash. Slice each in half length-wise. Cut off the narrow end of the yellow squash, and cut into about ¾ inch dice. Cut the zucchini and the remaining yellow squash in half length-wise again. Dice into ¾ inch pieces. If your zucchini is too thin, adjust accordingly. Add the squashes to the pan and stir around. While the squash cooks, prepare the shrimp. You can lightly season the shrimp with salt if you’d like. Stir the squash as it cooks from time to time. If the timing is working out correctly, when the rice has about 5 minutes to go, the squash should be ready. Place the squash in a bowl and set aside. Add more olive oil to the pan (1 tablespoon) . Press the second garlic clove into the pan and stir around. Add the squash back into the pan. Sprinkle the turmeric and coriander over the shrimp and squash. Toss them all together. Add the rice to the pan and toss together well until all the rice is yellowed by the turmeric. Distribute evenly in the pan and let cook a couple of minutes more so that the rice crisps a little at the bottom of the pan.